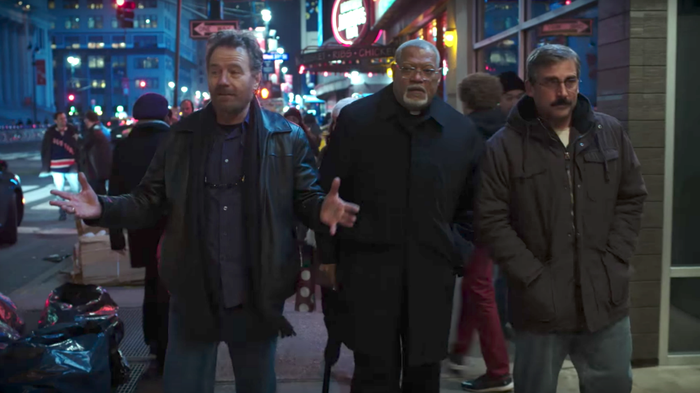 Richard Linklater’s latest film Last Flag Flying begins with that ancient set-up: A man walks into a bar. The man is Doc Shepherd (Steve Carell) the bar is Sal’s Grill and Bar, and the Sal in question is Sal Nealon (Bryan Cranston). Over pizza and beer, we learn that Sal is crude, cantankerous, free-wheeling and slovenly. Doc, on the other hand, is solemn, approachable and quiet — the antithesis of nearly everything Carell has built his comedy career on. The two men served together as Marines in Vietnam. So, a man yearning for war, a man struggling for peace and a man who just wants to be left alone are in a car headed to a funeral, and how much you’ll enjoy the film is dependent on how interesting you find their conversation and how entertaining you consider Carell, Cranston and Fishburne to be. 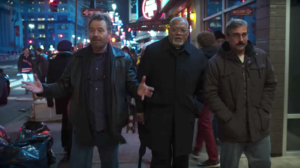 As far as Linklater films go, Last Flag Flying is far and away his most mature. There’s still his trademark brand of existentialist, anti-capitalist, leather-jacket philosophy, but it’s more tolerable coming from the mouths of bitter war veterans than it is coming from drug-addled college students. The pretentiousness is gone, as are the gimmicks of “Boyhood” and “Slacker,” and they’re replaced with a kind of anarchic aloofness. Sal, especially, loves clashing with the rigidity of the military, and Cranston seems to be having the time of his life here. His character is unsavory, slimy and constantly spouts racist lines about the “ragheads” in Iraq, but he’s tempered by Fishburne and Carell, both of whom thankfully loosen up a bit as the narrative unwinds. As Linklater’s ex-Marine Aragorn-Legolas-Gimli team grows closer to its mission’s end, the characters start to overstay their welcome and become kind of tiresome company. So it’s more than appreciated, then, when J. Quinton Johnson arrives in uniform as a soldier assigned to watch over Doc’s son during transit. The script, penned by Linklater and the original novelist Darryl Ponicsan, bristles with life and comedy, but its greatest scenes are the quiet, more sobering ones. One of the film’s best parts takes place just after Doc sees his son’s body, bullet wound and all. He sits, silent, wracked with grief, and when the others come up to console him, Doc manages, shakily, to say, “Sal, he doesn’t have a face anymore.” I don’t think there was a dry eye in the theater.